Industrial Style 5 Piece Dining Table Set. 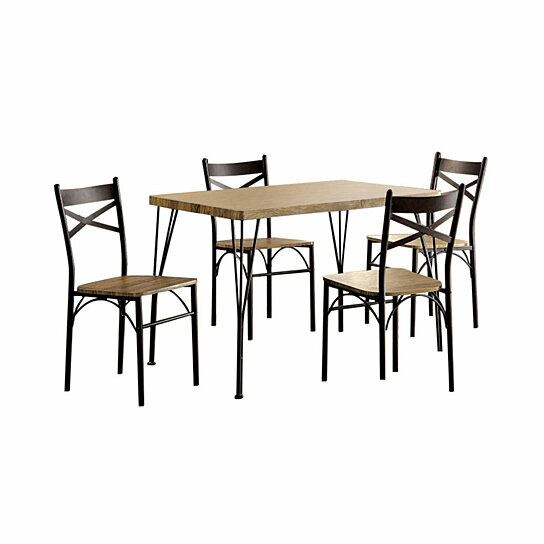 To enhance the charm of your dining room, this 5 piece dining set is the one you must have in your space. Perfectly crafted this dining set comprises four chairs and one wooden top table. Combining sturdy metal with light wood tones, the table showcases sleek rounded corners supported by unique triple-bar legs. The weathered seats of the chairs complements the design and add contrast to the dark metal frame. Ideal for family meals, this table set showcases casual comfort and reliable support to last for years to come. Table and chairs are made up of wood and metal coated in black powdered finish. Table top is of 40 mm thickness while the thickness of chair seat is 15 mm.